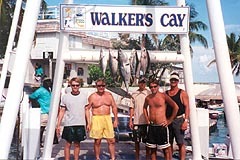 If you're a sportfisherman, nothing beats Walker's Cay. A diver? Did I mention the shark dive? All in all, this island is a must do, several times. Getting onto the Little Bahama Bank. Avoiding the shallows at Lily Bank. Running the maze into Walker's harbor. Getting onto the Little Bahama Bank from Florida offers enough options and perils that it has its own page. (see Onto the Bank on the menu). Once on the bank, there are still a few hazards, depending on where you came on. This extensive sand bank begins at the northern edge of Little Bahama Bank and runs many miles to the south. It is awash to less than 2 feet deep in most places at low tide, with occasional channels winding snakelike through it, often miles apart. The waypoint above will go south of the entire bank as of the last time I passed through the area. The charts of the area are NOT correct, as the hydrogophy is over 50 years old. If you entered the bank at White Sand Ridge, you cannot run directly to the Walker's stakes. You must stay south of Lily Bank. When you get in proximity of the above waypoint, keep a sharp lookout, as this sand seems to be building southward as the years go by. When running straight line routes to Walker's Cay Stakes from either Memory Rock or Indian Cay Pass, I've observed an extensive sand bank to the immediate south of the route, starting about 9.5 miles off the Stakes, in the general vicinity of Triangle Rocks. It's not been a navigational hazard, but bears watching when you arrive in this area. I'm told that safe passage south of this sand area into Grand Cay is possible, but I've not run that route myself. I also do not use the Triangle Rocks waypoint into Walker's mentioned in some guidebooks, and am unsure how it handles this sandbank. My own route stays north of it. This waypoint marks where the narrow rock reef guarding Walker's harbor on the bank side can be crossed, completing the last mile of the trip. It's usually a heartstopping experience, as the water is shallow and gin clear and the marks themselves are a maze. You'll be confronted with a long row of zigzagging pilings, a few hundred feet apart, with few clues as to which is the favored side of any of them. Most of the original wooden arrows have fallen off. The first two pilings are a pair. The last set of pilings are also a pair. Pass anywhere between them. All the remaining pilings should be left to the east. (Pass to the west of them). About this time hail the marina on channel 16 to learn where you'll be docking. Docking is always easy in the marina, other than traffic, as there's no current and it's sheltered from wind in 2 directions. There is also a usable anchorage outside the harbor on grassy bottom, but expect strong currents. The vessel will swap directions every 6 hours with the tide change, and care must be taken that the anchor doesn't pull and slide along the grass. The north side of Walker's Cay is fringed with a barrier reef, awash at low tide and unnavigible on any. This reef ranges from 1 to 2 miles offshore and extends both east and west of the island. There is no direct approach to Walker's Cay from the ocean (north). Stay east of those two points!! See the adjacent Seal Cay Pass writeup for safe passage information. at Walker's Cay, Abacos, Bahamas. Very popular, busy all summer, accessible by boat or air. No local community, workers come in daily from Grand Cay. 75 slips marina with water and electricity. North & Center: $1.35/ft any size. South Dock: $1.65/ft any size. Water metered at $.30/gallon as used. 62 unit fully airconditioned hotel. Mar 1 - Sep 4: $166/night. Sep 5 - Feb 28: $121/night. Excellent resturant with multicourse meals. Saltwater and freshwater pools and tiki bar. Small grocery and liquor stores. 2500 foot runway and aircraft tie downs. Local Customs and Immigration services. A Walker's Cay trip should be designed around fishing with an occasional dive. The only other form of reacreation available is lounging around the pool. There is no beach, as the island is iron hard rock with sharp erosion pockmarks. Even a slight fall on the edges near the water would be painful. Trolling is excellent other than the peak hot months of July and August, when it's spotty. Bottom fishing is always good, the deeper the better. Lots of small tackle action on the shallow reefs too. Stop by and ask Capt Billy Black, owner of the Duchess charter boats on center dock, for tips on what's biting and where. He'll always oblige. He also has an excellent charter service, and on the web at www.duchesssportfishing.com. Diving is okay if you're from a quarry in Ohio, but nondescript if you're used to the SE Florida coast or any of the Carribbean dive destinations. To make up for that, they have the best shark dive in that portion of the hemisphere. In the summer it runs twice a week, less in the winter. They have a full service diveshop, including fills for your own tanks. Fuel is at least a $.60/gal cheaper at West End than at Walker's Cay, and sometimes better than that. If your route to Walker's passes near West End, plan on topping off there inbound, and take on fuel outbound. I can defer 200 gallons per round trip if I plan it right, which is sometimes $200 savings. Don't miss an evening trip to nearby Grand Cay for dinner at Rosies. Go early so you can walk the small town and buy fresh baked bread at the local bakery. Unless you really know the waters (many hazards) call Lovetrain on channel 68 to arrange free boat service to/from by Rosies. It saves coming back at night, 3 sheets to the wind. Safe passage to/from Walker's Cay and the ocean to the north is available via Seal Cay Pass. From the oceanside, find the outer waypoint, then make for the center of the pass between Seal Cay and Tom Brown's Cay, staying in the middle of the pass until on the bank. Once clear of the pass, make an immediate hard turn and run close along the inner edge of Tom Brown's Cay, the across the channel between Tom Brown's and Walker's, and on into the harbor. Reverse this course to go oceanward.